Two and half years after the foundation of large herbivores reserve in a former military area in Milovice, not far from the capital city of the Czech Republic, Prague, the number of wisents has passed twenty individuals. Yesterday evening another two young animals were observed in the reserve for the first time. Currently the number of the wisents in the reserve has reached twenty-one individuals. The number of animals has almost tripled since the reserve’s foundation. At the end of 2015, animal conservationists brought seven females and one male into the reserve. In 2016 the first young animal was born in the herd. So far eight wisent have been born in the reserve, of which four were this year. Last autumn another five adult females from Białowieża in Poland were added to the herd. “It has been proven that newly founded wisent populations are considerably more viable and they grow faster when they are formed with a bigger number of founders. In the past, new populations were usually founded with five animals. With those groups it often took a number of years before they stabilized and their numbers almost did not grow for several years,” points out Miloslav Jirku of the Biology Centre of the Czech Academy of Sciences. That is just why the group in the former military area was founded with eight animals and later other animals were added. “The project has been working in close cooperation with scientists since the beginning. 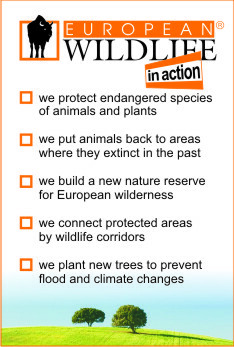 Therefore, we have access to the latest findings and do not have to repeat the processes which did not prove successful in other countries in the past,” said Dalibor Dostal, the Director of European Wildlife conservation organisation, appreciating the interconnection with academics and university specialists. In the former military area, where the armies of the Austro-Hungarian Empire, Czechoslovakia, Nazi Germany, and the Soviet Union trained, large herbivores have the task of grazing about one hundred and twenty hectares of steppe to protect it against becoming overgrown by aggressive grasses and shrubs. Together with the wisents, there are also wild horses and back-bred aurochs in the reserve. The former training area has thus become the very first location in the world where all three original species of European large herbivores appear within one reserve. After the First World War, man exterminated wisents in the wild and only a few animals remained in captivity – in zoological gardens and game reserves. More precious is the Białowieża line, which is also kept in the reserve in the former Milovice military area, which comes from only five founders. Thanks to international efforts, wisent reproduction has been successful in captivity, so since the 1950s conservationists have begun to return them back to the wild.